The majority of patients I see in clinic have non-specific pain, that is, it cannot be attributed to a specific pathology like a fracture, tear, or sprain. Nevertheless, the pain alarm has been triggered indicating that action needs to be taken. It can feel like a joint is out of place, but we know that most joints don’t go out of place unless there is significant trauma. It’s more accurate to think of the body in its current state as being unable to find a solution to performing a particular movement. The purpose of what I do as an osteopath/movement therapist is to enable the body to find a solution by giving it more movement options; to allow it to take another path; a path that doesn’t keep using the same fatigued, sensitised, and sometimes degenerate tissue. A way of making that process more effective is to work with the body upright and moving, and, provided the area in question isn’t too painful, to start applying load (resistance) to the painful area at an early stage. Load could mean use of a weight or resistance band, but could equally be a step, lunge, jump, squat (lower body) or a push-up (upper body), which make use of gravity and ground reaction force acting on the mass of the body. What does load do? In a nutshell it accelerates an adaptive process within the body. What do I mean by adaptive process? In simple terms, I mean tissues like muscles and tendon become stronger; new healthy tissue gets laid down around the damaged or degenerate tissue. Our nervous system adapts and learns to coordinate movements differently, and with greater speed and efficiency. But there is a further benefit. 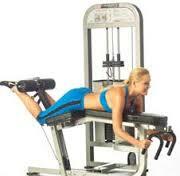 You are able to lift weight or bend with weights. You might still experience a little pain, perhaps no pain. You don’t just feel stronger physically, you feel stronger mentally. You have less of a sense of vulnerability, less fear, less need for your protective mechanism. My sister asked me to take a look at my 12 year old niece Grace at the weekend, as she was worried about a lump on her shoulder (she also has left knee pain). The lump turned out to be her collar bone, which was more pronounced on the left due to compensations occurring through her body because of an unstable left foot. 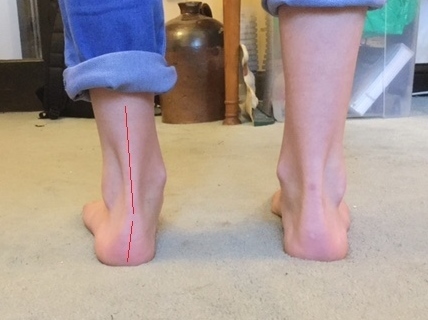 The photo below shows the position of the foot, though it is really how the foot is functioning that is the problem. The foot has also caused limitation of her left hip as the big muscles of the hip attempt to control it. Her knee, caught in the middle, is taking the hit. “She’s all wonky” exclaimed my sister before instructing her daughter to stand up straight and roll her foot out. “I think that’s what Katie has” said my mum “She’s getting insoles”. I was struck by how little my family know about my professional beliefs and the principles by which I am guided – drawing on success; highlighting the positive; the body’s immense intelligence and ability to adapt and take a different path; the subconscious nature of movement and need to re-pattern movement without too much conscious thought on the part of the patient. As soon as Grace takes a step, gravity, ground reaction force, and the mass and momentum of the body will drive the foot and conscious attempts at controlling the motion will at best fail and at worst cause a problem elsewhere. So we have commenced functional exercises directed at stabilising the foot and reversing the compensations in the hip and trunk. No conscious holding of a position, no insoles (unless we find we need them), just the use of the principles of movement to direct the body to take a new path. Most of us are aware that sitting for long periods has serious consequences for our health, leaving us at higher risk of diabetes, heart disease, and, of course, back, neck, and shoulder pain. Unfortunately many of us have desk-based jobs which require us to sit. So what can you do to counter the effects of sitting? Fidget. Shifting around in your chair is beneficial. Even changing your foot position is advantageous. Try placing one foot under your chair for example; it will have the effect of tilting your pelvis forward, forcing you to sit upright. Sit on a wobble cushion. An inexpensive wobble cushion placed on your chair will help you to keep moving while you sit. Most importantly, it varies the position in which your hips are held. Stretch. As a mentor of mine likes to say “motion begets motion”. It doesn’t matter too much what you do; move and stretch your body, challenge the effects of gravity, and you will do yourself some good. See the video in my blog about stretches for the trunk (thoracic spine), if you need inspiration. Take regular breaks from sitting. 1 minute every 10-15 minutes ideally. Consider a standing desk. Several studies show that standing desks can dramatically improve low back pain either caused or aggravated by sitting. Other studies demonstrate benefits in terms of weight loss, decreased blood sugar levels, and decreased risk of heart disease. In this short video clip I give one example of why hip extension is important in maintaining a healthy low back, and demonstrate a stretch that improves hip extension while avoiding irritating the joints of the low back. In the last post I explained how tight calf muscle, or reduced ankle dorsiflexion, can cause problems elsewhere in the body. Here I show you how you can stretch your calf in all three planes of motion, which is necessary because it controls motion in three planes of motion.